Ludwig Wittgenstein is universally regarded as one of the greatest thinkers of the twentieth century. Years ahead of his time, he worked primarily in the fields of the philosophy of the mind, mathematics and language. Born into one of the richest families in Europe in 1889, he began life in Vienna, moved around a fair bit, and died in Cambridge in 1951. Wittgenstein was an odd sort. He gave away his inheritance when in his twenties and suffered the suicide of all three of his brothers at an early age. For the most part he made his own way in life – eventually finding himself studying under Bertrand Russell at Cambridge a little before WWI. During the war he served as an officer in the Austro-Hungarian army, and thereafter lived for several years in Austria. He returned to Cambridge in 1929, where he spent most of the next decade or so, and, bizarrely, served as a semi-anonymous porter in Guy’s Hospital, London, during WWII. It was whilst working there that he fell in with Doctors Reeve and Grant who were interested in philosophy and the effect of shock on air-raid casualities. 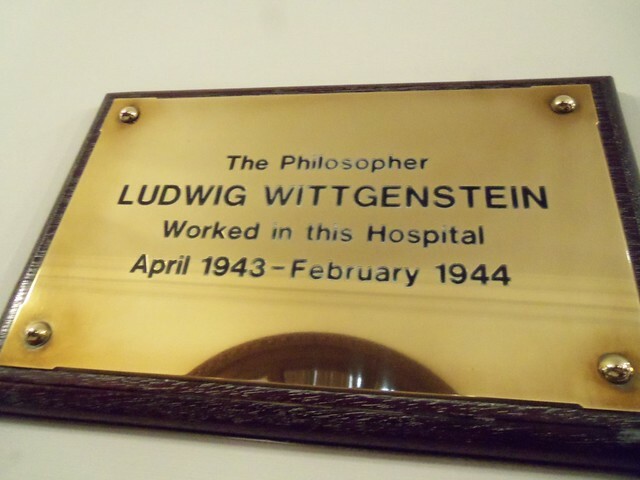 When, in November 1942, the two doctors moved their studies to Newcastle’s Royal Victoria Infirmary, Wittgenstein was offered a job as their lab assistant at £4 per week – a post he eventually took up in April 1943. He became a lodger at Mrs Moffat’s house at 28 Brandling Park, Jesmond, where Reeve and Grant also lived. After several months living here it seems that the landlady’s ill-health forced a move, with Wittgenstein transferring to Conyers House in Western Avenue, Benwell, where he lived alone. By all accounts, Wittgenstein didn’t really fit in very well with his friends and colleagues. He was often chatty at the wrong times and unsociable at others – though he did like watching films, especially westerns. He was mechanically minded and proved to be a good technician in his lab at the RVI – though he only worked there for ten months until February 1944. He did no philosophical work of note during this period, though he did gatecrash a philosophical lecture being given by Dorothy Emmett in Newcastle in his typically difficult fashion! Upon leaving the North-East he soon found himself back in Cambridge where he picked up his philosophical work. Plaques have recently been erected at both 28 Brandling Park and the RVI to commemorate the great man’s brief stay in the city. 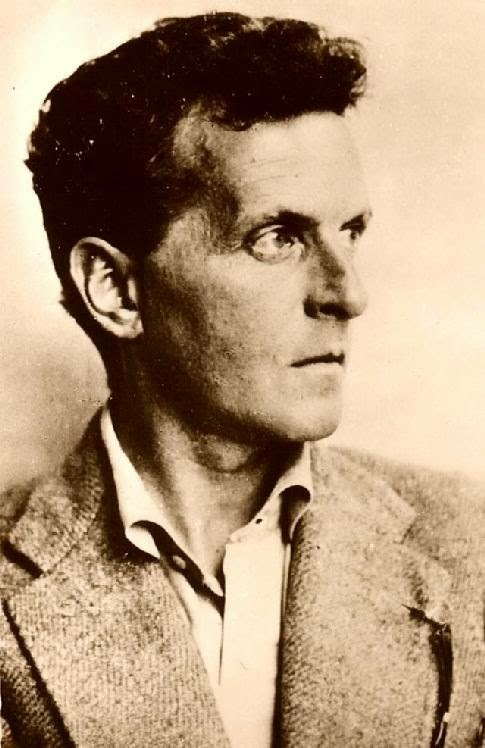 Note: Incidentally, Wittgenstein visited Tyneside briefly in 1932 at the behest of his friend Maurice Drury, during which time he called in at Newcastle and Jarrow. * My clever title has been stolen from the excellent article by Bill Schardt. More information can also be found here. Images of plaques here and here. © Copyright Weston Beggard and licensed for reuse under this Creative Commons Licence. 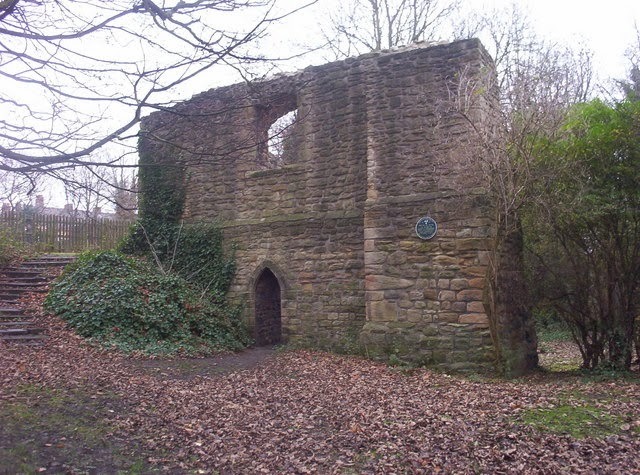 Despite being one of Newcastle’s most ancient relics, the ruin known locally as King John’s Palace is a bit of a mystery. Situated on high ground in Heaton Park overlooking the Ouseburn valley, it may be more correctly described as the House of Adam of Jesmond. Dating, as it does, from the 1250s, it has nothing to do with the much maligned King John, who died in 1216. John was known to have stayed in the immediate vicinity on his journeys north, but almost certainly stayed elsewhere – and the ruin which remains today has perhaps understandably become confusingly entwined in the story of the old king. Instead, the building was most likely built and first occupied by one Adam of Jesmond, a deeply unpopular local landowner and Sheriff of Northumberland. Adam was a knight and a supporter of King Henry III. He was always in trouble for embezzlement and extortion, and when he failed to return from a crusade in 1270 no one seems to have been too upset. His house was allowed to fall into disrepair thereafter, though it was periodically revived for use as farm buildings in the ensuing centuries. In 1879 it was given to the city, and in 1897 the various farm-related attachments were removed and the building was consolidated. What remains of Adam’s dwelling essentially amount to the north wall, north-west turret, and part of the east wall, plus earthworks to north and south. © Copyright Christine Westerback and licensed for reuse under this Creative Commons Licence. The Byker Wall, as all who live within a sizeable radius of Newcastle will know, is an unbroken block of 600+ high-rise dwellings situated in the eastern reaches of the city. It is an extraordinary experiment in mass social housing, and has attracted much attention – both good and bad – over the years. Designed by architect Ralph Erskine in the late 1960s, the mish-mash of a complex (and much of the outlying area) was constructed during the 1970s. The process ran concurrently with the demolition of a huge swathe of Victorian slumland and also factored in the effect of a planned motorway, which, as it happens, was never built. Almost everything about the scheme was considered revolutionary. It was a pleasant break from the brutalistic concrete monstrosities of previous years with its colour and quirkiness, and was designed to harbour a distinct sense of community among its residents. With this in mind, locals were widely consulted during the design and construction process – even to the extent of, in some cases, the provision of purpose-built accommodation. © Copyright Martin McG and licensed for reuse under this Creative Commons Licence. 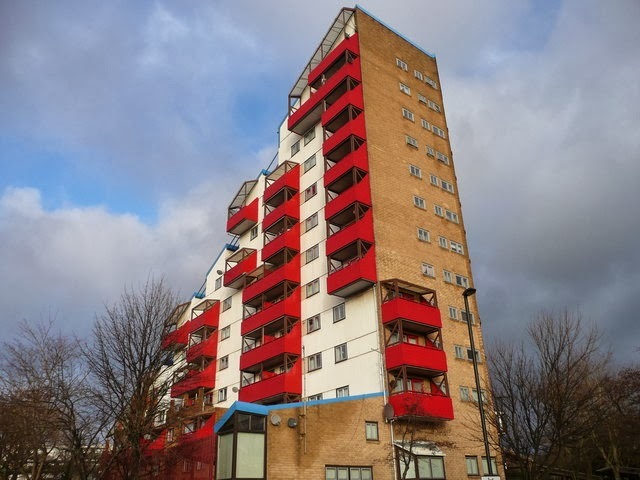 Recent refurbishment has greatly helped the general look of the estate, and the ‘Byker Community Trust’ was founded in 2011 which effectively took the Wall and its neighbouring properties out of the control of the city council and into that of the local people. Despite the fact that the Byker Wall elicits a mixed response from befuddled outsiders, it maintains a certain sense of community spirit and collectiveness (and indeed pride) among its occupants. 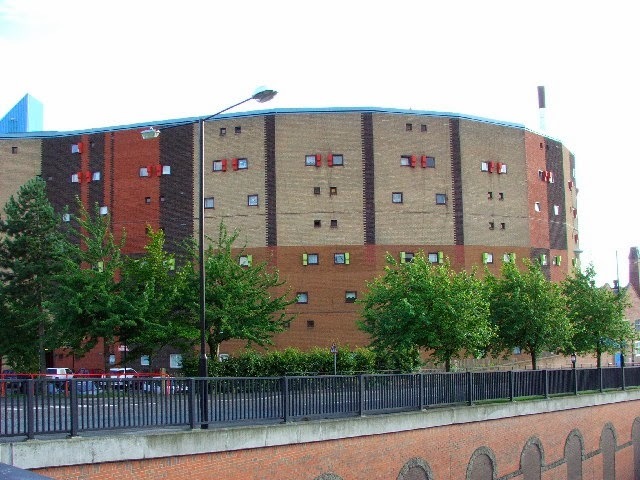 Furthermore, the Byker Wall, undoubtedly one of the most unusual experiments of its kind in the UK, has won its fair share of awards over the years and is now a listed building. Extraordinarily, the Wall has also been placed on UNESCO’s list of outstanding twentieth century buildings. Built in 1622, Denton Hall is one of the few surviving examples of Jacobean architecture in the region. And what a fine specimen it is. The mighty edifice was built by Anthony Errington, the estate’s owner at the time and a big player in the early coal industry of the area. He lived with his wife Dorothy and two sons at his new hall for a mere ten years before his death in 1632 – the property passing to his first-born, Lancelot. During the English Civil Wars the Erringtons supported the king and, as a result, ultimately lost their Denton estate by degrees over the ensuing years. Their catholic sympathies did them little good, either, of course. Ownership of the hall slid to the Rogers around 1700, then onto the Montagu family in the late 1750s – more specifically, Edward, who took possession along with his wife, Elizabeth, a woman who was to become the most famous figure in Denton Hall’s history. At first apprehensive of her husband’s recent acquisition – and especially its northerly latitudes – Mrs Montagu soon took to her new environment. They would stay at the hall in the summer months – Edward attending to his coal, farming and other business interests in the area, with Elizabeth throwing herself into various social and charitable tasks. In time, these duties grew and expanded as she further integrated herself into the local community. For example, she founded a school at Denton for the children of the pitmen, and was always attentive to the needs and demands of the local workforce. Mrs Montagu was an accomplished writer and was interested in all manner of topics, from the literary to the scientific, as well as moral matters (among many others). Visitors to Denton Hall included the likes of Dr Samuel Johnson, Dr Joshua Reynolds and David Garrick, and several others of note. She was considered something of a leader of society, and was regarded as the ‘first woman’ for literary knowledge in England. Elizabeth was also a prominent figure in the so-called ‘Blue-Stocking Society’. When her husband died in 1775, Elizabeth inherited all of his property. She carried on running his old affairs with great efficiency and cared a good deal for her ‘black friends’, the term she employed for the pitmen and their families. She continued visiting her ‘Gothick Mansion near Newcastle’ almost every summer until 1789, after which old age began to get the better of her. She died in London in 1800, aged 80. During the 19th & 20th centuries the hall passed from the Montagus to the Rokebys and beyond – though for much of the past two centuries it has been tenanted (its most famous occupant being that of ‘Silky’, the resident ghost). Eventually it fell back into the hands of catholic ownership, becoming a nunnery in recent decades – indeed, today it is the official residence of the Roman Catholic Bishop of Hexham & Newcastle and is formally known as ‘Bishop’s House, East Denton Hall’.